Easily track your team’s tasks in one clear view, and rearrange them on the fly. The Streamtime Premium plan comes with advanced resource planning and scheduling. 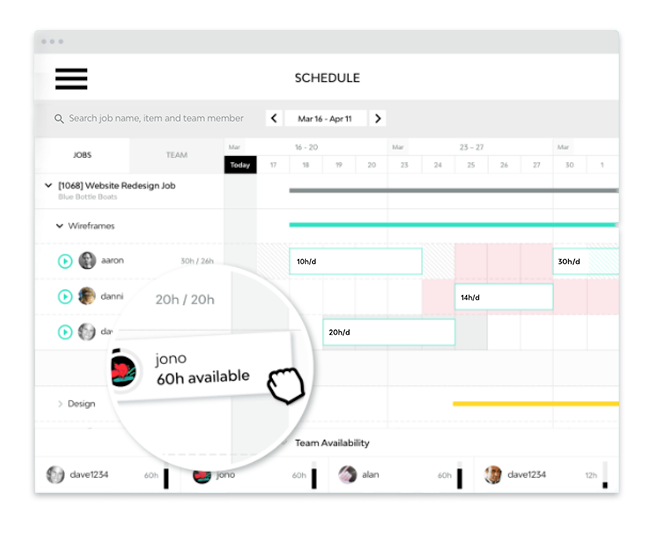 The Schedule presents your team's planned work in a Gantt chart, and is a great place to allocate resources simply by dragging and dropping your team directly onto a job. Your team's availability is displayed in a bar along the bottom of the screen where their capacity is presented clearly in a progress column. Here, you'll be able to select a date range and see either how much time each team member has available, or if they're currently over capacity . setting up a job without a team then picking a team from available team members. setting up a job with a team then adding in hours and dates based on their availability and ability to do the work. how individuals see work that's scheduled to them on their TO DO screen.